Are you wondering if a Newfypoo puppy is right for you? We will cover everything you need to know about the Newfoundland Poodle mix in the guide below! The Newfypoo seeks to combine the intelligence and active temperament of the Poodle with the patient, devoted personality of the Newfoundland. The result is a friendly, intelligent breed with a loving personality. 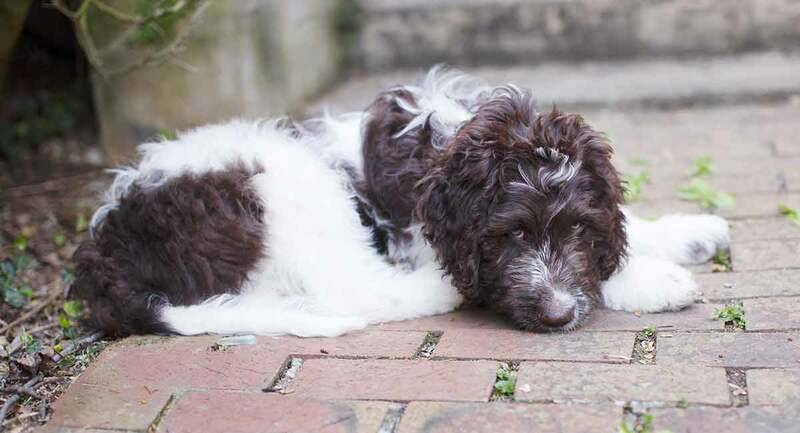 And we must admit – the curly hair and kind, endearing face of this breed is tough to resist! For a variety of reasons, the Newfypoo is becoming a popular choice for many families and dog-lovers. But there’s more you should know about the Newfypoo dog. For one, this is a first-generation breed – which is controversial for some. We’ll discuss this controversy below before getting into the detailed Newfypoo information. A so-called “designer dog” is a cross between two purebred dogs. The Newfypoo, by definition, is a designer dog. There is some controversy surrounding these first-generation crosses. Purebred advocates argue that keeping dog breeds pure offers more consistency and predictability – which is true, to some extent. On the other hand, advocates of designer dogs claim that keeping bloodlines pure can lead to health issues – which is also true, to some extent. Studies have shown that smaller gene pools can lead to an increased risk of inherited illness and genetic weaknesses. Neither side is strictly right or wrong, and this debate is likely to continue for years to come. If you’re interested in further reading, this article on hybrid vigor from the Institute of Canine Biology is a good place to start. We also covered this topic in greater detail in our Purebred vs Mutt article. 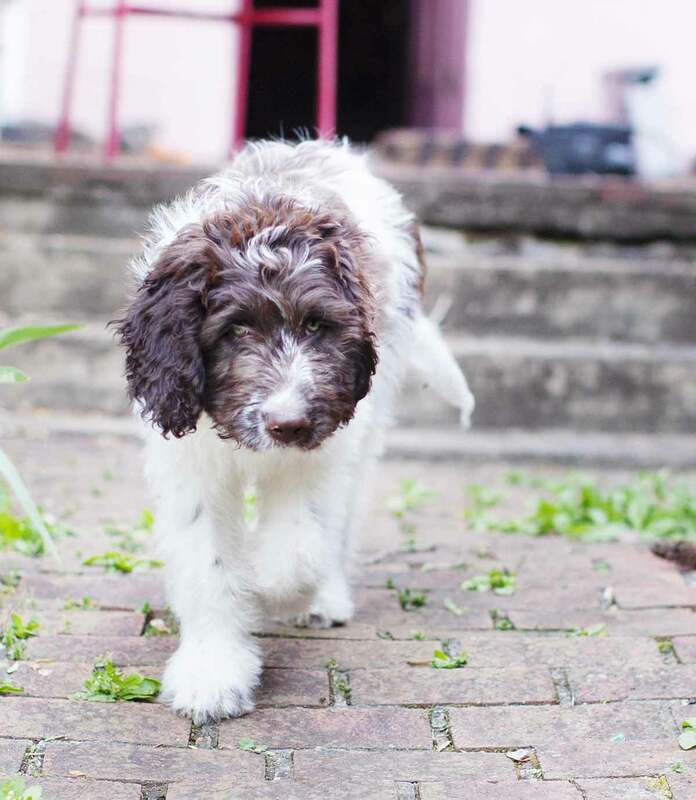 Now that we’ve addressed the controversy, let’s learn more about the Newfoundland Poodle mix, starting with the breed’s origins! Like many first-generation crossbreeds, the exact origin of the Newfypoo is not known. However, we do know that the Newfypoo originated in the United States. The exact date of origin is unknown, but the International Designer Canine Association began recording and recognizing the breed officially in 2009. For more information on the origin of this fine dog, we can look to the roots of the parent breeds. The Newfoundland dog as we know it today originated from working dogs brought to England from Newfoundland in the early 1800’s. The exact origin is unclear, but there is written evidence of the breed from as early as 1775. The Newfoundland is a loyal working dog that has been used throughout history in a number of different working roles. The dogs were often used on fishing boats and other sailing ventures, and even served an important role in the Lewis and Clark expedition! Known for their devoted, patient, and hard-working nature, the Newfoundland makes for an excellent working dog or family pet. The Poodle is the National Dog of France, and remains extremely popular in France today. Despite the popularity in France, the Poodle actually originated in Germany. It was bred for use as a duck hunter, and its history dates back more than 400 years. The Poodle began as a hunting dog, but soon joined the lap of luxury as a popular domestic companion. The Poodle is a highly intelligent, proud breed. Today, it remains a popular show dog as well as a family pet. So, what happens when you cross these two breeds? You get the Newfypoo! The Newfypoo is a large dog, with a weight typically between 70 and 150lb. Their height spans from 22 to 30 inches. The physical size of the dog will depend on what genes come through stronger. The Poodle is a midsized dog, at 40-70 lbs, while the Newfoundland is a massive 100-150 lbs. Thus, if you get a Newfypoo that’s mostly Newfoundland, you may end up with a very sizeable dog. Or you could end up with a midsized, Poodle-dominant mix – or anywhere in between! This is an important factor to remember with any crossbreed: the outcome is unpredictable. Physical and behavioral characteristics can vary significantly depending on the genetic makeup of the dog. You’ll never be able to fully predict the characteristics of a mixed-breed dog – so if you’re looking for ultimate predictability, a purebred dog may be a better fit. The Newfypoo typically has a thick, curly, oily, and water-resistant coat. The natural oils in their coat can sometimes stain walls and furniture, so this is important for potential owners to keep in mind. The majority of Newfypoos will be various shades of black, brown, or grey, but other colors are possible as well. Of course, these characteristics can vary significantly from dog to dog, because this is a cross-breed. The cross between Newfoundland and Poodle typically results in a friendly, affectionate, and loyal dog. Newfypoos are highly intelligent, loving, and protective dogs. They typically get along well with just about everyone, so long as they are properly socialized. This breed is fiercely loyal and loving, and these dogs will always keep a protective eye on their families. Despite this protective nature, Newfypoos are usually open to meeting new people and other dogs, and are not generally overprotective or distrusting. This intelligent breed requires both physical and mental stimulation in order to thrive. They enjoy training and regular exercise of both mind and body. Newfypoos typically do well with children, but young children should always be supervised. Despite their typically friendly nature, aggression is always possible with any breed. Proper socialization is absolutely key to raising a friendly, well-behaved pup. Grooming is essential for this breed, and can be rather time-consuming. The thick, curly coat of the Newfypoo requires frequent brushing, ideally on a daily basis. It should also be trimmed fairly regularly, as the Poodle’s genetics means that the coat will be continually growing. Ears should be checked regularly for signs of infection or irritation. Newfypoos should be bathed around once per month, or as needed. Keep in mind that Newfypoos also love to get dirty, wet, and muddy whenever possible – so you may end up bathing them more than you expect! Despite their relatively thick coat, Newfypoo shedding is actually minimal to moderate. With frequent brushing, shedding isn’t a major concern with this breed. Some Newfypoo owners report difficulty in taming the thick, oily coat of their dogs – so many choose to utilize professional grooming services. Like any hybrid breed, Newfypoos may be prone to some of the health problems their parent breeds suffer from. It’s impossible to predict what problems, if any, a dog will suffer from. But it’s good to be aware of any potential health concerns so you can watch for warning signs. Newfypoos are prone to eye health concerns, including progressive retinal atrophy (PRA), cataracts, glaucoma, and cherry eye. Bone and joint problems are also a concern. Hip and elbow dysplasia and patellar luxation are relatively common in this breed. Heart conditions should also be on the owner’s radar. Subaortic stenosis, dilated cardiomyopathy, and related heart health concerns are common. Other potential health concerns include sebaceous adenitis, diabetes, epilepsy, and more. As with any breed, frequent vet visits are important to maintaining proper health. Even more so than with many other breeds, diet can play a huge role in the health of your Newfypoo. Newfypoos may be prone to bloat (gastric dilation volvulus), a potentially life threatening condition. As large dogs, Newfypoos eat a LOT of food – but intake should be closely monitored and discussed with your veterinarian. To avoid bloat and related issues, some vets will recommend smaller, more frequent meals for this breed. Speak with your veterinarian if you have any questions or concerns. The Newfypoo is a fairly active breed. While not hyperactive, they enjoy frequent walks and activities. Ideally Newfypoos should get at least 60 minutes of vigorous exercise per day. This breed enjoys walks and runs, and also takes naturally to swimming and water activities. Keep in mind that young Newfypoos can damage their joints by doing too much jumping and playing. It’s best to tire them out with low-impact activities like walking or swimming so they don’t get overzealous with their playing. As for training, Newfypoo dogs will typically respond well. They are intelligent dogs and are usually eager to please their owners. The Newfypoo can make for a wonderful companion. Their friendly, loving nature is endearing, and they are quite adorable! With that said, this breed is certainly not for everyone. First off, this is a LARGE breed that can even enter the Giant categorization. That means they need plenty of space, a large vehicle for transportation, and a huge quantity of food! It also means they are expensive to feed and maintain. Newfypoos are also highly social and can suffer from separation anxiety. Thus, the ideal owner will have plenty of time to spend with their pup. This breed also needs plenty of exercise, and will be happiest if they are able to swim and run regularly. The Newfypoo also requires a degree of patience. They are avid diggers, and their oily coat can sometimes leave stains on walls and furniture. Lastly, the grooming requirements for this breed are relatively high and can be time-consuming. In short, this is a wonderful dog to own – but it’s NOT an easy one! Prospective owners of Newfypoos should closely consider the care requirements for this breed, as well as the potential health concerns. Cost should also be considered, as food alone for a Newfypoo can easily exceed $50 a month. If you’re okay with all the downsides of this breed, and can set aside the time and love to properly care for the dog, then the Newfypoo can make for a fantastic companion! This is not a very common breed, so it can be difficult to locate a Newfypoo puppy. A Newfypoo rescue through a local adoption agency is always possible, but shouldn’t be counted on. It’s more likely that you’ll have to purchase a puppy – and if you do that, you must make sure you’re dealing with a reputable breeder! Finding Newfypoo breeders can be difficult, depending on where you live. The breed is not very popular yet, so breeders can be hard to come by. You want to find a reputable breeder that takes good care of their pups. Beyond that, the breeder should conduct all necessary health tests on their breeding stock. Hip and heart tests are the most important for this breed. If you do find a reputable breeder, the Newfypoo price will typically be around $500-$2,000, with the bulk falling in the $1,000-$1,500 range. Of course, this varies depending on your region and other factors. To locate a breeder, search the internet for local sources. You may also look into local dog clubs and breed clubs for advice. Before committing to a breeder, be sure to do your homework. Research the breeder’s reputation, and speak to past clients if possible. Also, don’t be afraid to ask the breeder about their certifications, training, and any health tests they conduct on their dogs. If they are defensive or unwilling to answer your questions, that’s a sign that you should avoid their services. Wiersma, et al. Evaluation of 15 candidate genes for dilated cardiomyopathy in the Newfoundland dog. Journal of heredity, 2007. Dekomien, G., & Epplen, J. T. The canine Recoverin (RCV1) gene: a candidate gene for generalized progressive retinal atrophy. Mol Vis, 2002. Notes, B. Canine Gastric Dilatation-Volvulus (Bloat). EPIDEMIOLOGY. 1995. Leighton, E. A. Genetics of canine hip dysplasia. Journal of the American Veterinary Medical Association, 1997.